So, Nick Cave pens his second screenplay, teams up with John Hillcoat as director, and with Warren Ellis (of both the Bad Seeds and Grinderman) to produce the soundtrack. For his latest endeavour in film, Nick Cave has written both the screenplay and the music for John Hillcoat’s new movie Lawless, which stars Tom Hardy, Shia LaBeouf, Guy Pearce, Jessica Chastain, and Gary Oldman. The film hits theaters August 29, while the soundtrack will be released via Sony on August 28. For the music, Cave teamed up with long-term collaborator Warren Ellis to form a band called the Bootleggers, playing country and bluegrass that mimics the film’s setting (rural Virginia in 1931). They rounded up a rotating cast of guest vocalists, including Emmylou Harris, Mark Lanegan, the Duke Spirit’s Liela Moss, and bluegrass icon Ralph Stanley. 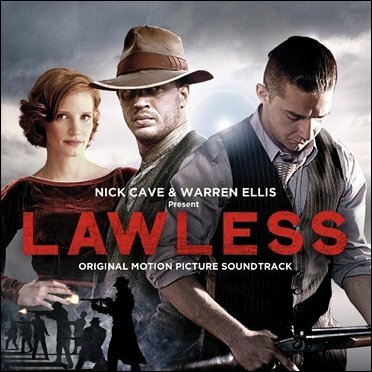 via Nick Cave & Warren Ellis’ Lawless Music Features Mark Lanegan, Emmylou Harris, Ralph Stanley, More | News | Pitchfork.